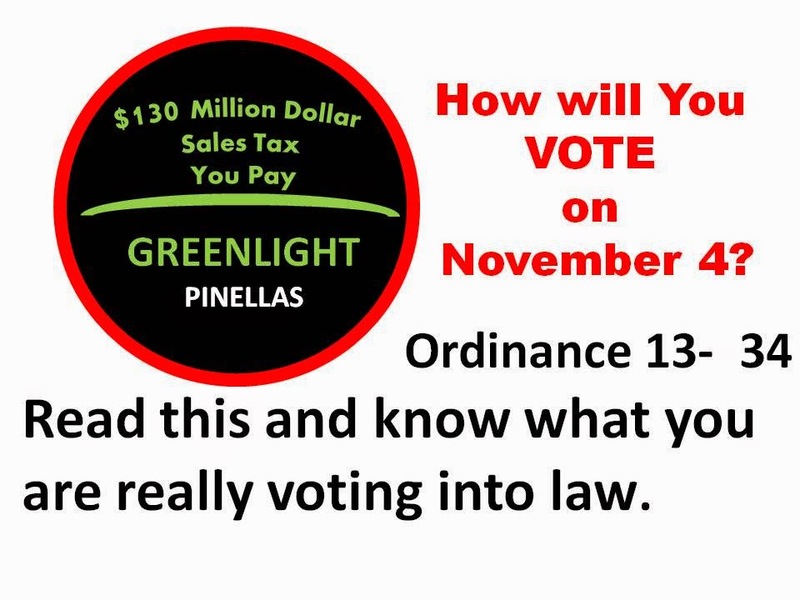 In the November 4, 2014 election Sales Tax Referendum you are NOT voting directly on the GreenLight Plan. Read that title very carefully. You are voting to make Ordinance 13- 34 a law. This is an important distinction, because Ordinance 13- 34 will become a law if the referendum succeeds, but the GreenLight Plan does not. which activates if the Sales Tax Ordinance passes. This section establishes the legal grounds for the administration and collection of the sales tax. This Section identifies the State Statute that provides for charter counties to levy sales surtaxes. There is no definition of the GreenLight Plan, no detail for the Greenlight plan and no specific funding allocation for the bus portion of the GreenLight Plan. The GreenLight Plan is more of a marketing phrase than a referendum requirement. There is nothing here that ties the County or PSTA to the Greenlight plan, requires any of the sales tax proceeds to actually be spent on the plan. In fact in the next WHEREAS it becomes clear that the real intent is to fund a bonding effort. The question is with the PSTA property tax revenue at about $40 million and an expected $100 to $130 million in annual sales tax revenue, if the Bus expansion is really the plan, could that not be handled from the additional sales tax revenues without any bonding or borrowing requirements? This Section establishes that the Sales Surtax will be applied at the full 1% ($130 million) rather that gradually applied as State law allows and as the PSTA budget needs actually require additional funding to expand bus service. This Whereas sets the general reasons for proceeding with the Ordinance. It is by design general in approach tries to rope in as many feel good points as possible other than leading to the next Whereas. This Whereas, however, accepts the two above it as fact, lumping the previous Whereas in to the general term "transportation improvements" which becomes the supporting subject of the final Whereas. WHEREAS, the levy of the Surtax therefore is in the best interests of Pinellas County and its citizens and is necessary to sufficiently fund needed transportation improvements benefitting the County. In this Whereas, the circular logic of previous three Whereas clauses are now assumed to be in your best interest and a totally valid reason for you to accept the necessity to fund an undetermined plan and one or more to be determined interlocal agreements, and obligation bonds to build an undefined transportation system for which you will pay $130 Million per year for a to be determined period of time. Note that any bond issue where the sales tax is pledged as a bond revenue source would prevent any repeal of the sales tax and there is no provision preventing refinancing of any initial bond issue which could, without voter approval, keep the sales tax in force literally forever. This Section establishes the Florida Department of Revenue as the authority for administration, collection, and enforcement of the Surtax levied pursuant to this Ordinance, but the County will distribute the funds via a series of undefined interlocal agreements to PSTA. Note that there are NO terms of revenue distribution in the Ordinance and there is no definition of the terms of the undefined interlocal agreements. The funds may be held by the County but should they be pledged as bond payments, the bond covenants will set the terms for distribution. There is no specific funding identified for the Bus system expansion. (b) Subject to the limitations imposed by applicable law, the Surtax proceeds shall be used for the improvement, construction, operation, and maintenance of public transit benefitting Pinellas County, including an expanded bus system with bus rapid transit, increased frequency and extended hours, and local passenger rail and regional connections, and for the payment of the principal and interest on indebtedness (including refinancing thereof) or other financial obligations which may be incurred for such transportation improvements, as authorized by the Acts. The County is authorized to enter into interlocal agreements pursuant to the Acts providing for the distribution of the proceeds from the Surtax to be expended for the purposes authorized in this Ordinance. In this Sub Section we get close to a commitment to expanding bus service, with some detail: expanded bus system with bus rapid transit, increased frequency and extended hours; but no specifics related to the amount of funds, distribution or obligation of funds to the bus expansion or timing of the bus system expansion. There also no provision for preventing taking funds from the bus system to pay for cost overruns on the rail project or future shortfalls in rail operating revenues. In this Sub Section the Ordinance REQUIRES that all of the sales tax funds received be remitted to PSTA as provided for vaguely in the proceeding Section and further lays the ground work for a bond issue based on the Ordinance. This sub section essentially stops the County from withholding funds from PSTA as a punitive measure should PSTA go out of control. Note that there is no reporting or accounting provision applied via this Ordinance on PSTA to account for any of the funds. (c) The County shall enter into the Inter local Agreement with PST A for the distribution and use of the proceeds of the Surtax as provided in subsection 4(b) herein. Any Surtax proceeds deposited in the Transportation System Surtax Trust Fund shall be remitted to the PST A in accordance with the Interlocal Agreement, and shall be used for the purposes authorized in subsection 4(b) herein, including the payment of the principal and interest on bonds or other obligations or indebtedness, or refinancing such bonds or other obligations, issued or incurred for such transit improvements, as authorized by the Acts and this Ordinance. Section 5. Conduction of Referendum Election. The Board hereby calls a referendum election and directs the Pinellas County Supervisor of Elections to conduct such election in conjunction with the General Election on November 4, 2014, for the submission of a referendum question to the electors of Pinellas County to determine whether a majority of electors voting in the election are in favor of the levy of the Surtax on transactions occurring within Pinellas County as provided by law. Reasonable costs associated with conducting said election shall be paid by the County. This Section formally calls for the Referendum to approve the sales tax increase and indicates the County will pay for the costs associated with the referendum. Title: Levy of Countywide One Percent Sales Surtax to Fund Greenlight Pinellas Plan for Public Transit. This is the actual language you will see on your ballot. 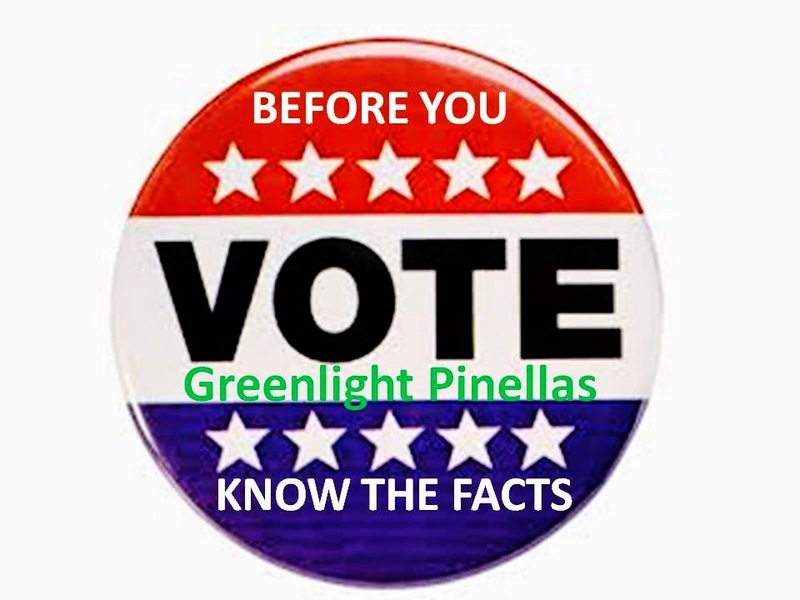 The Title of this referendum contains the Words Greenlight Pinellas Plan but there is no place in the actual Ordinance you are being asked to approve that specifically assigns or dedicates any specific funds or percentage of funds to the GreenLight plan. The Ballot language was carefully crafted to support the preplanned marketing effort and to mislead voters. This is the only place these words (GreenLight Plan) appear in this Ballot Language and they only appear one other place the Sales Tax Ordinance. The objective here is to attempt to tie all of that advertising and information you will be getting in the mail, seeing on TV and reading on the back of PSTA buses supporting this initiative to the ballot referendum. You will note that the official Ballot Language Summary does not contain the words Greenlight Pinellas or GreenLight Plan. Section 7. Notice of Election. The Clerk shall publish notice of the referendum in accordance with Section 100.342, Florida Statutes, on the following dates: October 1, 2014 and October 15,2014. This Section sets the formal Publication Notices that will appear in the legal section of a local news paper, and be posted on public bulletin boards. Section 8. Notice to the Department of Revenue and Department of State. Upon completion of the referendum election called for in this Ordinance, the results of such election shall be certified in accordance with Chapter 100 and Chapter 102, Florida Statutes, to the Department of State. If it is determined upon certification of the results that the majority of the electors of Pinellas County voting in the referendum election are in favor of the levy of the Surtax, the Clerk shall, within ten (1 0) days of such certification, but in no event later than November 16, 2015, submit a copy of this Ordinance and the certification of the election results to the Florida Department of Revenue. The notice shall specify that the Surtax will go into effect on January 1, 2016, and will be in effect until repealed as provided by law, that a surtax of 1% will be imposed and provide such other information as the Department of Revenue requires by rule. The Clerk shall also provide the additional notice to the Department of Revenue required pursuant to Section 212.054(7)(b), Florida Statutes. This Section establishes the time frame, notice and actions of the State Clerk who will notify the Department of Revenue and the Tax will go into effect January 1 2016. In other Words, it would require a legal action challenging the entire Ordinance to cause a full repeal if you vote to make this Ordinance a law; something that would be lengthy, costly and unlikely to happen. While it appears that the County may be in control, actually do to the overlapping of County Board of Commissioners and the PSTA Board and the number of elected officials whose jurisdictions could or will benefit from the way the sales tax monies are spent and the lack of defined controls; the PSTA will actually be in control. Section 11. Filing of Ordinance; Effective Date. In addition to the notices to the Department of Revenue as provided herein, pursuant to Section 125.66, Florida Statutes, a certified copy of this Ordinance shall be filed with the Department of State by the Clerk within ten ( 10) days after the enactment by the Board. This Ordinance shall become effective upon filing of the Ordinance with the Department of State. It is difficult to truly determine if this Ordinance is just poorly written or cleverly crafted to mislead the voters. Even the most casual reader should begin to see that Ordinance 13- 34, The Sales Tax Referendum, is not about public transportation it is about establishing a large stream of unmanaged tax revenue to an Authority,(PSTA), that is controlled by politicians not directly elected for that purpose and strongly influenced by special interests who stand to benefit significantly from the revenue flow. This Referendum is not about public transportation, it is all about turning PSTA into the most powerful, publicly funded redevelopment agency ever created in Pinellas County. Along with its powerful supporters: National, State and Local Association of Realtors, leading financial organizations, Chamber of Commerce, electric Utilities and other major players, all of whom stand to benefit greatly, will be a deep pockets force determined to get their way for decades to come in Pinellas County. Thank you for taking the time to read through this lengthy Ordinance and my analysis. Please feel free to copy and reproduce this document, link to it and forward it to your friends on social media and via e-mail.